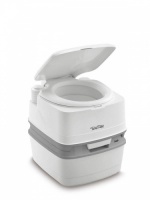 If you are looking for a comfortable, practical and durable portable toilet that doesnt have to be connected to a drainage or water system, Thetford have the perfect solution for you: The Porta Potti. Good quality achieved through years of experience in portable sanitation. Because the toilet is compact, lightweight and easy to use, the Porta Potti is often used in caravans, motor homes, boats, folding trailers and even summer houses. But these portable toilets also come in handy during house renovations or just as a second toilet. The Porta Potti is simple to transport and really can be placed anywhere. Thetford pay a lot of attention to quality, thereby ensuring that your Thetford Porta Potti will give you many years of trouble-free service. Porta Pottis are made of durable high-grade plastic, which, combined with their rounded shape, means they are easy to clean and maintain. And these portable toilets have many innovative features that optimise comfort and ease of use, such as an integrated emptying spout, a luxury electric flusing system and a level indicator for the waste-holding tank. The Porta Potti consists of two sections. 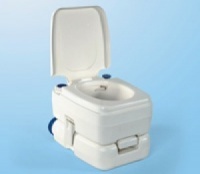 The upper section is a combined flush-water tank and toilet bowl with detachable seat and cover. The lower section is the waste-holding tank. The two parts are easy to detach using a handle at the rear of the toilet. Adding the correct dosage of Thetford Toilet Care products to the waste-holding tank using the emptying spout is simple. Water and flush-water fluid can be poured directly into the top of the flush-water tank. All models feature a unique integrated rotating emptying spout, making emptying as simple as can be. There is no need to dismantle or clean seperate parts. The waste-holding tank also has a vent button, which you press while emptying to prevent unpleasant splashing. The Porta Pottis are equipped with a level indicator (except Porta Potti 145 & 165) so you are warned in good time when the waste-holding tank needs emptying. What is a Thetford portable toilet? 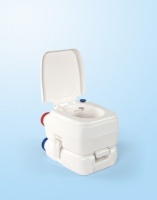 Thetford Porta Pottis are two-piece, fresh-water flush toilets that conveniently travel anywhere a toilet is needed. They are easy-to-carry, completely self-contained, sanitary, odorless, leak proof, and hold their own fresh water supply for flushing. Where can Porta Pottis be used? The simple answer: wherever one is needed. In fact, portable toilets have a multitude of uses - probably many more than you may have imagined. Of course, they're commonly used for leisure-related activities: in vans and van conversions; boats; camp sites; in cabins and cottages; on hunting trips; and with RV's (smaller models, pop-ups, or as a second toilet for larger RV's). But they're also ideal for: toilet training children; construction sites; bedside; over-the-road, long-haul trucks; emergency situations; and locations where there is a shortage of water and/or power. 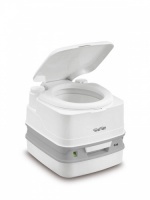 How does a Porta Potti work? There are many models... how do I decide? How do I repair my Porta Potti's flushing bellows? 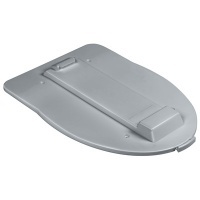 Before removing the old part, be sure to purchase the replacement bellows that's right for your Porta Potti model. Comprehensive instructions for removal of the old part and installation of the new part come with the new bellows. What should I use to clean my Porta Potti? We recommend you use Thetford's Aqua-Clean®, a high-grade, non-abrasive cleaner, and a soft sponge or cloth. Do not use a highly-concentrated or high-acid content household cleaner, nor those containing abrasives, such as a scouring powder. They'll scratch the surface of your Porta Potti, diminishing its looks, and also could hamper its performance by damaging the valve seal or plastic parts.